It is White to move in this game from the 1986 Ukrainian Championship. IM Igor Khmelnitsky has the White pieces - how did he force Black's resignation? Click here for the elegant but simple solution. It took a little while, but the final standings of the 2007 U.S. Junior Open have been posted. 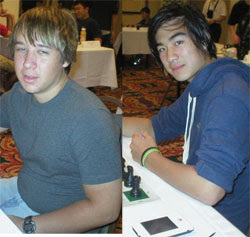 Brian Goldstein and Edward Lu finished in a tie for first, with 4.5 points in the six-round event. Brian narrowly beat out Edward in tiebreak points. Mat Prilleltensky came in third a half-point behind. Chessville has published a brief article from IM Igor Khmelnitsky warning of the dangers of back rank mates. He provides four relevant examples. It might take only five minutes to read the article, but it will be five minutes well spent. Jeffrey B. Siebrandt Wins Sixth U.S. Blind Chess Championship Title! (Crossville, TN) USCF Chess organizer Rick Varchetto ran USCF's 2007 U.S. Blind Chess Championship in Buckhannon, West Virginia. Play concluded June 23 with Jeffrey B. Siebrandt claiming his U.S. Blind Chess Champion title for the sixth time! The four round event was held at the Hampton Inn. 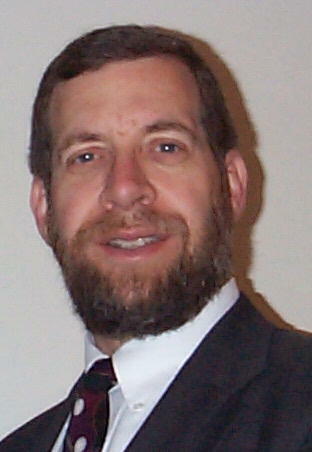 Jeffrey B. Siebrandt of Texas won with a 3.5 score. Agan Hajric of New York tied with Jessica T. Lauser of California for second place with 3.0. Alexander Barrasso of DC took fourth with 2.5. Albert Peitrolungo of Maryland tied with Joseph C. Wassermann of Pennsylvania and Virginia Alverson of Massachusetts with 2.0. Richard A. Mc Straw of Ohio and Allen Betts also from Ohio tied for 8th with 1.0. Nicholas Stockton of Virginia finished out the field of 10. Chief Tournament Director Tim Just directed this USCF National event. The crosstable can be found here. Games from the tournament can be downloaded here. Dr. Daaim Shabazz of The Chess Drum website has begun a companion chess blog, with daily posts thus far. His website, by the way, has an extensive game library worth visiting. And the Winner Is ... ??? The 2007 U.S. Junior Open concluded Sunday afternoon, June 24, but the final round results have yet to be posted more than 24 hours later, and an e-mail I sent requesting a final crosstable has not yet been answered. Heading into the final round, Brian Goldstein held a slim half-point lead over Edward Lu. According to the MonRoi site, Goldstein drew his last-round game, but they don't show Lu's final game. It shouldn't be this difficult to obtain the results of a national event. Anyone have any updated information? It might better be termed the 2007 Florida Junior Open with its overwhelming preponderance of players from Florida, but the 2007 U.S. Junior Open gets underway today in Tampa, Florida. The preliminary list of participants can be found here. On the strength of better tiebreak points, Evan Ju has won the 2007 U.S. Cadet (Under 16) Championship, with 7 points in the ten-round event. Tied at 7 points was Warren Harper, who was awarded second place. At the mid-point of the tournament, Harper had only amassed two points out of a possible five, but then followed with five consecutive wins, including defeating Ju in round nine. Robert Lau finished close behind, with 6.5 points. The other players were Alec Getz, Thomas Riccardi and Jeffrey Haskel. Here is the final crosstable. Additional coverage can be found in a Chess Life Online article by WGM Jennifer Shahade. As the only player to go undefeated through the nine rounds of the 2007 U.S. Junior Invitational, Marc Tyler Arnold has captured the title of 2007 U.S. Junior Champion. Arnold, last year's U.S. Cadet (Under 16) champion, finished with 4 wins and 5 draws, good for 6.5 points. FM Ray Robson got off to a slow start, with a loss and two draws in his first three rounds, but finished strong, with four victories and two draws in subsequent rounds, to end with 6 points and second place. Xiao Cheng came in third at 5.5 points. The other competitors included Corey Acor, Elliott Liu, Mackenzie Molner, Ryan Milisits, Alexander Barnett, Eric Rodriguez and FM Teddy Coleman. Congratulations to all these young players! The final crosstable can be found here. ChessLecture.com has made available a free audiovisual lecture, entitled "Tactical Motifs 105: In-Between Moves (Zwischenzugs)." To download the lecture, go to the Free Internet Chess Server - the download link is on their home page. We're now seven rounds into the nine-round 2007 U.S. Junior Invitational Championship, and Mackenzie Molner and Marc Tyler Arnold remain atop the standings, with 5 points apiece. The always-dangerous Ray Robson is close behind at 4.5 points. The championship concludes tomorrow. In the 2007 U.S. Cadet (Under 16) Championship, eight of ten rounds have been completed. Evan Ju is in clear first place, with 6 points, followed by Warren Harper with 5 points and Robert Lau with 4.5. This tournament has the odd schedule of different time controls (either game/90 or game/120) on alternating days. The championship finishes tomorrow with a final round time control of game/120. At the 2007 U.S. Cadet (Under 16) Championship, four rounds have also been played. Evan Ju has pulled a full point and a half ahead of his nearest competitors. Ju has a perfect 4-0 record, with both Robert Lau and Alec Getz standing at 2.5 points. The 2007 U.S. Junior Invitational Championship, for players age 20 and under, is currently underway in Tampa, Florida. It began June 17 and will conclude on June 21. After two rounds (out of nine total), only Corey Acor of Florida has managed two wins. A half-point behind are Marc Tyler Arnold from New York (last year's Cadet winner) and Georgia's Xiao Cheng. The other players are Mackenzie Molner, Alexander Barnett, Elliott Liu, Ryan Milisits, Teddy Coleman, Ray Robson, and Eric Rodriguez. Selected games are being presented at MonRoi. The 2007 U.S. Cadet Championship (age 16 and under) is being played concurrently. Six players are in this ten-round event: Robert Lau, Evan Ju, Warren Harper, Jeffrey Haskel, Alec Getz and Thomas Riccardi. When these two tournaments conclude, the 2007 U.S. Junior Open Championship will start. It is scheduled to run from June 22-24. As a frequent reviewer of chess books and software, I am aware of the difficulties in properly presenting a condensed but informative review of what may be voluminous text or video. Rick Kennedy offers one of the more unique reviews I have come across, in his assessment of Dangerous Weapons: The French, by IM John Watson. I think you'll enjoy it, at the Chessville website. 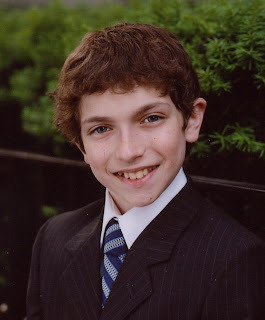 Chess Life Magazine reports that IM Josh Friedel has been awarded the 21st annual Samford Scholarship. The Samford Scholarship was created "to identify and assist the best young American chessmasters by providing top level coaching, strong competition and access to study materials. The Fellowship also provides a monthly stipend for living expenses so that the winners may devote themselves entirely to chess without having financial worries. The total value of the Fellowship is approximately $32,000 annually for two years." 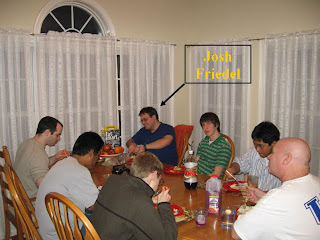 You can also hear a bit from Josh in my March 2006 Scholastic Chess ChessCafe column. That column included a discussion of the U.S. Chess School, following the school's first session which included Friedel. USCF Dues $588 Per Year? I was enjoying flipping through my copy of the June 2007 Chess Life magazine, with its nice articles, interviews and photos. Then I came to page 13, which contains an ad which begins, "Get Chess Life for $49 a month." At this point, I was especially thankful that I've been a USCF Life Member for quite some time. On the other hand, this might help improve the USCF's financial condition. Say the USCF has 30,000 full dues-paying members. Now we've got $17,640,000 coming in each year. Hello, fully endowed U.S. Championship! Maybe we could create the new CNN - Chess News Network. I'm all for it. Especially as a Life Member. 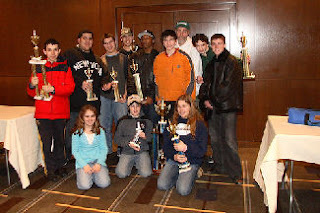 WGM Jennifer Shahade has a nice article reviewing the recently completed 2007 National Open, at Chess Life Online. As usual, she includes a number of interesting games, including IM Irina Krush's victory over newly crowned U.S. champion GM Alex Shabalov. There is also a nice photo gallery by Betsy Dynako. My latest Scholastic Chess column at ChessCafe is now online. It is entitled "2007 Spring Championships, Part Two." 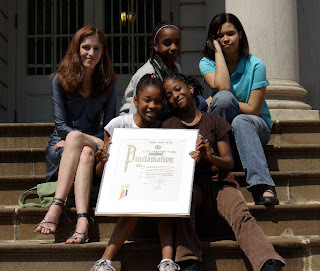 The primary focus is on Brooklyn's Intermediate School 318, which came away with multiple local and national championships this year, and on Anna Ginzburg of New York's famous Stuyvesant High School. Guess where she went to middle school? That's right - I.S. 318. "What’s 4”x6”? An index card? A postcard? In this case, it’s Bruce Pandolfini’s latest book. The back cover states, “Here are 111 quirky, surprising, and fun tactical chess problems to improve anyone’s game.” Indeed the shape of the book itself is quirky, surprising and fun." For the beautiful (if lengthy) solution, click here. "I have been teaching children how to play chess and their initial plan is usually something like a4, Ra3 or h4, Rh3. While I try to teach them the ‘correct’ way to develop, I also try to learn from them. 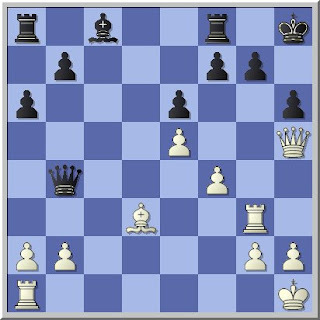 In this, I was also inspired by Deep Fritz’s rook manoeuvre vs. Kramnik. If Black continues normally, the plan is Rh3, Ra3, simplifying the position and keeping the pawn, which gives a very pleasant Benko (just remove a pair of rooks and the position is much easier to defend). If Black plays ...e6, then after the pawn exchanges Rh3, Re3 with an attack (since Black cannot sacrifice on the queenside, open the center, and finish kingside development). 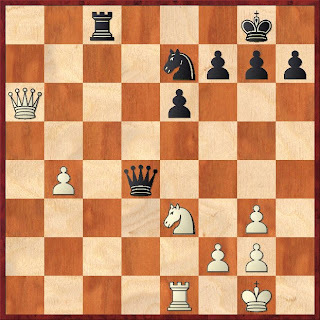 Simply attacking on the kingside, with h5 or g4. I would like to propose the name ‘the kindergarten attack,’ since my young pupils were the source of this inspiration." There are five books that have been nominated for a 2007 Quill Award for Best Sports Book of the year. One of them happens to be The Kings of New York, by Michael Weinreb. Michael spins great stories from the real-life Edward R. Murrow chess team - if you haven't read it yet, do yourself a favor and curl up with it on a rainy day. Read about the 2007 Quill nominees here. A nice 17-minute interview took place yesterday on WYNC - New York Public Radio with Eliot Weiss, coach of the Edward R. Murrow chess championship team, Michael Weinreb, author of The Kings of New York, and Mikhail Furman, sophomore member of the Murrow team. Want to learn more about the Murrow team? Click here for our many posts and you can read my April 2007 Scholastic Chess column at ChessCafe where The Kings of New York book and the Murrow team were the subject of the column. Elizabeth Vicary sent along these great pictures of Brooklyn's I.S. 318 middle school chess team being honored at City Hall for their multiple national championships. Congratulations! The picture below is of I.S. 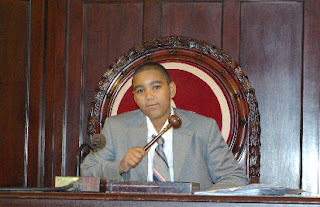 318 team member Michael Peguero, receiving an award from the Dominican Consulate. You can find some cute and apparently real comments from the younger set at chess events, posted by Bill Wall at www.chess.com. Two first graders at a tournament were playing chess. The chess coach asked the boy playing black what his rook (on the other side of the board) was doing because it is laying on its side. He looks up and grins, "He is sleeping!" Two first grade girls are teamed up against a first grade boy. One of the girls stands up in the middle of the game, puts her hands on her hips and says to the boy, "Rachel and I are queens. We own all the gold, all the silver, all the jewelry, and all the castles in the whole world…and you are just a little boy!" During a game between two first grade girls, one girl was impatient that her opponent was taking too much time. She looks up at me and says, "I looked into her brain and she wasn’t thinking about the game!" The latest edition of Chessville is online with two-time state champion NM Bill McGeary annotating an interesting game from the 2001 Seville Open (Spraggett-Campuzano). You can find Chessville's extensive annotated game index here.